A captivating story, wonderful characters, exotic locations... and yes Puzzles! Hershel Layton is back for one more round of mystery solving, in what may be the best Professor Layton game since the Unwound Future! In Professor Layton and the Azran Legacy, Hershel Layton, true gentleman and infamous adventurer, is recruited by fellow archeologist and Azran enthusiast Professor Sycamore, to help him solve a mystery regarding a living mummy, a girl believed to be the last living proof of the Azran Civilization, found deep into the mountain village of Froenborg. Will Emmy’s Hershel Layton’s last adventure become a tale for the ages, or will it falter like a forgotten civilization? Not only you get to visit different locations all over the world, In each of these exotic locations you’ll get to solve a mystery regarding a tale of folklore or a recent occurrence, some more intriguing than the others, but all of them carry a characteristic staple of the Layton series. The mysteries become more convoluted, the twists and turns more unpredictable... familiar faces make a return, and new faces make their debut. The game is a treat for the returning fans of the series. Choices Choices and more Choices! Yet... it’s not all about the different locales you get to visit, but how the game let’s you set your own pace and order to explore the world. After a typical start for the series, where there are more questions than answers, the game takes a turn at the fourth chapter. You’re given full control of your adventure and are free to choose how the hunt for the Azran Eggs develops, given the option to choose from five different locations scattered around the world, the linearity that has been characteristic in previous entries is broken in the Azran Legacy. But for all the praise regarding the freedom you’re given by the new mechanic, the locations take a backseat compared to the touching plot and the personages encased within. Continuing where the Miracle Mask left of, the Azran Legacy quickly ties the loose plots that were not dealt in the previous entry, but the game doesn’t shy away from adding a new set of antagonists full of cooky and bizarre characters, Targent, an organization led by the enigmatic Leon Bronev, whose cameo in the Miracle Mask left fans of the series baffled by his association with Scotland Yard’s prodigious inspector, Leonard Bloom. The colourful iteration of London has served as the parting point for the professor’s previous journeys, and in his latest adventure it is not the exception, only that on this occasion the city plays a key role in the unfolding of the events later in the game. Few others make the capital of England feel as vivid and evocative as the Layton Team, accompanied by the live version of the London Theme from The Unwound Future, the waltzing melody grants an stoic yet welcoming aire to the city. Most of the music for the game is performed by the Professor Layton Grand Caravan Orchestra, an ensemble of musicians led by the works of Tomohito Nishiura, the series veteran composer. The soundtrack of the game explores a handful of genres and styles... from the evocative Title Track with undertones influenced by the wave of Tango and Milonga that caught Japan by surprise in the 80s, to the sombre and calculated piano melodies of the Puzzle Solving Theme. Collectibles, minigames, and just like in the Miracle Mask, over 365 free daily puzzles, not to mention the many sidequests spread all over the main adventure. Bonus videos, character profiles, the game has content for dedicated puzzle solvers. Some of the stories during the hunt of the Azran Eggs lacked that grandiose aura related to the series, some of them suffered from lack of pacing or a real threat, in the end they all focused on searching for a couple of clues before moving on to the next quest, and here is where the game goes back to it’s linear story, it’s a bit contradictory that in the portion of the game where you can explore the world, some of the quests fell victim of the linear nature of the franchise. The Bread and butter of the series... complete a couple of puzzles, move on in the story, watch a cutscene and back to solving puzzles. Although the game felt much more balanced and the puzzles were more relevant to the situations and surroundings, especially when compared to previous entries, there were portions of the game where the puzzle solving felt mundane. It rarely happens... but it’s still lingering and it hurts the overall experience. For those who have never ventured into the Layton universe my best advice is to start with the Last Specter. And to those who felt the Miracle Mask fell flat to the expectations of the series moving to the 3DS, worry not, the Azran Legacy makes up for the mistakes of its predecessor. 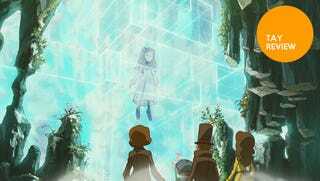 Level-5, outdid themselves once again, the Azran Legacy brings closure to the many mysteries surrounding Layton & Luke’s first adventure. Mind bending puzzles, a touching story filled with twists, and a farewell to everyone’s favorite assistant, make Professor Layton and the Azran Legacy the best game in the Second Trilogy of the series.